Mathews Monster Chill R is a high end compound designed for those who need a reliable, light and very fast bow. It has been redesigned in comparison to its predecessor, Mathews Chill, in order to increase performance and reduce overall weight. The new design looks similar but a closer look reveals changes in brace height and AtA length. Due to these few tweaks the bow feels much more stable in the hand during the shot. Furthermore, Chill R scores great customer reviews for phenomenally smooth draw cycle and lack of noise or vibrations. If you are a speed freak you’ll notice that the IBO speed was increased to 342 fps. A solid wall complements the package. Mathews Chill R features a Geo Grid Lock riser which is based on an advanced geometric pattern. 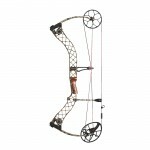 This makes the bow extremely lightweight and makes it one of the lightest compound ever produced. It doesn’t however compromise the rigidity of the riser. This patented technology was applied in other Matchews bows and during the last few years was tested and tweaked bringing it to perfection. On the riser a Reverse Assist™ Roller Guard is mounted which helps to make the bow extremely smooth. Contrary to the traditional roller guard this device positions cables in front of the of the roller guard. This reduces the tension in a fully contained roller guard once the the cables roll during the draw. The grip used in this bow is the famous, ascetic looking Focus grip. For those who’ve never held a bow with a Focus grip it may initially feel a little weird. You will, however, get used to it pretty quickly. This grip was designed and is highly praised for virtually eliminating the hand torque. Focus grip is made of a special hard rubber. The material and texture makes it warm to the touch. This rig was equipped with state of the art Quad V-Lock limbs that are positioned parallel to each other. The V-Lock system facilitates optimal positioning of the limb at each stage of the draw. The V-shaped end of the limbs are placed in a VLOCK area where they are always perfectly aligned. Additionally the limbs are securely locked in place by a reverse locking mechanism. 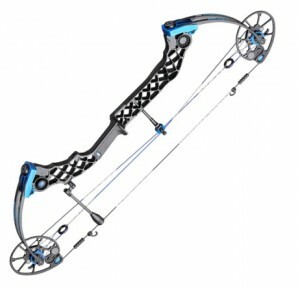 This system also reduces the possibility of damaging the bow with a bow press which is quite high with parallel limb bows. Behind the excellent speed and jaw dropping smoothness of this compound is a new Mathews invention – the DYAD AVS cams with Dual Perimeter-Weighted Technology. This feature is an obligatory point in any Mathews Chill review. Thanks to the Advanced Vectoring System utilized in these cams the process of storing the kinetic energy is extremely efficient yet still allow for a surprisingly smooth draw cycle. This is very unusual for a bows in this speed category. Another impressive feature of this cam system is the Perimeter Weighed technology designed to reduce vibrations and noise. This technology is based on a principle of inertia. There are special weights located inside the cams which after the shot are stabilizing the limbs. This results in reduction of the noise and recoil to levels close to non existing. Black finish as a name suggests is predominantly black with some blue elements (on cables, cams and limbs). Black tactical finish is black except for limbs which are black and grey. Blue Ice is similar to Black finish but features blue limb pockets. In Lost Camo both riser and limbs are in brownish camouflage pattern. Desert Tactical finish features sandy color riser, limbs and string. Dead End String Stop Lite used in this bow eliminates any string oscillations after the shot and dampens the noise associated with them. This is a lighter, yet equally efficient, version of the famous Mathews Dead End String Stop. Limb vibrations are cancelled by the above mentioned cams with Dual Perimeter-Weighted Technology. The string is equipped with string grubs which reduce string vibrations after the shoot. This not only reduce noise but also facilitates faster arrow speeds. Any riser vibrations are deadened by Harmonic Damper which consists of weights floating in an elastomer wheel and absorbing any recoil vibration of this part of the bow. This technology is so efficient that is currently applied in other mechanical devices across a wide range of industries. Matchews Chill R is also equipped with a Harmonic Stabilizer Lite which can capture 75% of residual vibrations and weighs only 30% of the original Harmonic Stabilizer. finish Black; Black tactical; Blue Ice; Lost Camo; Desert Tactical.